Noticed two cases where the search results message is unnecessarily dispatched to the aria-live region. When the view is initially rendered, looks like announceSearchResults() runs both on render and on the query:success event. When doing a search in the Themes Installer and after the results are displayed users might want to select or edit the search terms in the input field to refine their search. To do this they will probably use the arrow keys (or the Home/End keys, etc.). As soon as an arrow key is pressed, the search results message will be dispatched again to the aria-live region. Investigated a bit and looks like this happens because there's nothing to check which keys get pressed or to check if the search terms have changed. At the very least, I'd say there should be a check on the search terms, also for consistency with what happens in the Installed Themes screen. in the Themes Installer instead, themes.view.InstallerSearch does extend themes.view.Search but then implements its own search and doSearch functions which miss to check the search input field value against the previous search. 36848.patch​ (1.2 KB) - added by afercia 3 years ago. Note: it's better to test this with Firefox and NVDA or IE and JAWS because of #36853. 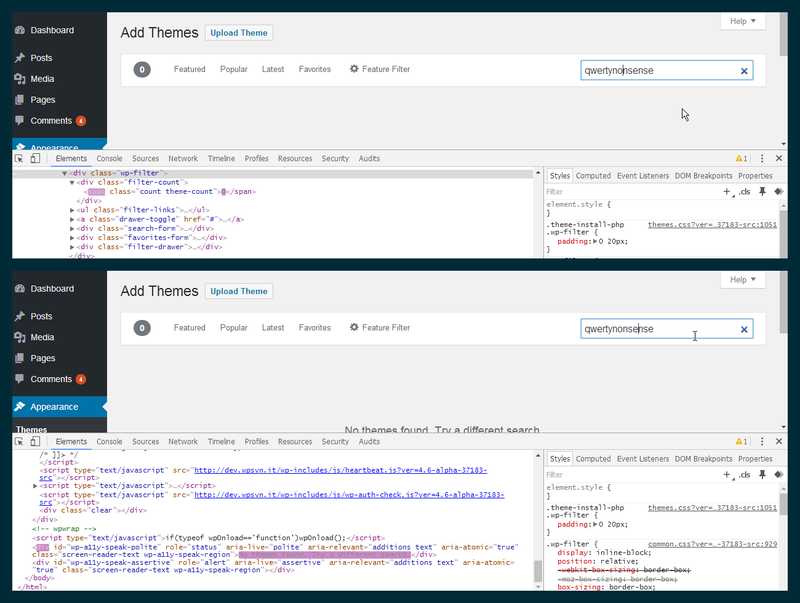 Themes: Avoid announcing the theme search results too many times.